At CES, you can always count on Fossil to show up to Las Vegas with an army of smartwatches. The same is true this year, but now the star of the lineup is the new version of Fossil’s Kate Spade scalloped touchscreen smartwatch. Fossil introduced the watch last year, but aside from a cute aesthetic it didn’t offer much in the way of specs. It ran Android Wear 2.0, had no GPS, no heart rate monitoring, no NFC payments, and its unique features were all fashion-based. This time around, Fossil is adding built-in GPS, an optical heart rate sensor, and NFC payments. More disappointing is that it’s still relying on the outdated Qualcomm Snapdragon 2100 chipset, leaving its cousin – the Fossil Sport – as the sole affordable 3100-powered smartwatch currently on the market. You can probably expect the same one-day (at best) battery life you get on most Wear OS smartwatches, though the rapid charging feature does take some of the sting out of it. In person, the Kate Spade smartwatch is quite pretty – though to be honest, most of Fossil’s offerings are. The new scalloped band is a nice touch though, as is the heart-shaped animation that shows up on screen whenever you take your heart rate. 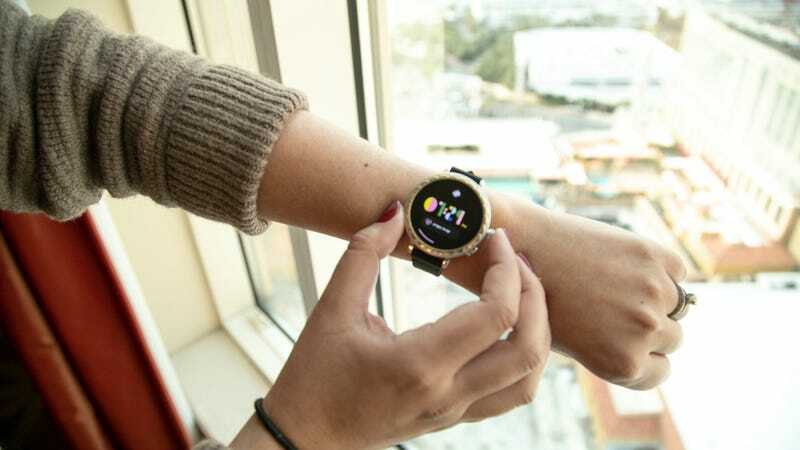 The upgrade to Wear OS 2.0 (not to be confused with the second version of its predecessor, Android Wear 2.0) is also a big boost in functionality, with an improved Google Fit and Google Assistant experience. And in addition to basic activity tracking, the watch is also water-resistant to 3 ATM. Basically that means it should be safe for the shower or a light dip in the pool. You will pay a lot for the Kate Spade name, however. The watch is expected to ship in the spring, and the standard version with either the scalloped strap or a blush-tone strap will retail for $295 ( £231). The slightly fancier, metal-link version will cost you $335 ( £263). As usual, actual UK pricing and availability TBC. In terms of special software, the watch is also limited to the choose your look microapp, which lets you match the watch face to whatever outfit you’re wearing. That said, this is the same price the watch retailed for last year. At least this time around, you get the appropriate specs to justify the price.